Through its Trelleborg Engineered Systems subsidiary, Trelleborg has acquired the operations of Dunlop GRG Holdings in <?xml:namespace prefix = st1 ns = "urn:schemas-microsoft-com:office:smarttags" />Manchester in the UK. The company is privately owned, has some 50 employees and annual sales of approximately 70 million SEK. Dunlop GRG Holdings develops and manufactures large, specially adapted flexible containers for the protection and transportation of fluids, such as fuel and water. These are used in marine operations, the defence industry and global rescue operations and disaster relief. 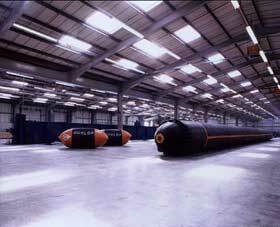 The Manchester operation will be integrated fully within Trelleborg Engineered Systems’ existing organisation. The same Swedish subsidiary has also acquired the operations of Andre Structural Bearings in the UK, which has annual sales of approximately 10 million SEK, from Silentblock UK Ltd.
Andre Structural Bearings complements Trelleborg’s operations in bearings for infrastructure projects, including bearings that protect against seismic movements. Trelleborg’s Engineered Systems business had net sales of approximately 4 billion SEK in 2004 and has about 3,200 employees. Its head office is located in the town of Trelleborg, Sweden and production units are located in Australia, Canada, France, Germany, the Netherlands, Norway, Singapore, Sweden, the UK and the US. The business also has a distribution organisation for industrial supplies in North America.